When MMA star Randy Couture fought Tim Sylvia in March of 2008, he did so against the wishes of the MMA faithful. People were concerned for his safety as Couture was 43 years old and coming out of retirement to battle the much larger champion who stands at 6 feet, 8 inches, tips the scales at 300 lbs. and is 13 years his junior. Couture rocked the monstrous Sylvia with his first punch, eight seconds into the fight, and dominated the entire affair in an awe inspiring performance to capture his third UFC Heavyweight Championship. That night, “Captain America” went from hero to legend. 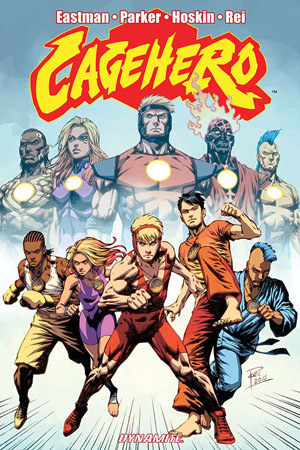 High school student and wrestling sensation Ryder Stone learns about his true destiny when he joins a super-powered team of mixed martial arts fighters and strives to live up to his adopted name, Legend, in the pages of Dynamite Entertainment’s Cage Hero.